Thirteenth-century Japan is a dangerous place, even in a time of peace. Capricious gods, shape-changing animals, and bloodthirsty demons are as real and unpleasant as a gang of vicious bandits. From the wilderness emerges a young, idealistic warrior with his father’s mysterious sword on his hip, a wise, sarcastic dog at his side, and a yearning in his heart to find a worthy master. He dreams only of being samurai. Little does he suspect the agony and glory that await him when his dreams come true. Finding a master should be easy for a warrior as skilled as Ken’ishi, but the generations-long wars for the Imperial throne have ended. The land has settled into an uneasy peace and cast multitudes of proud, powerful warriors to the four winds. 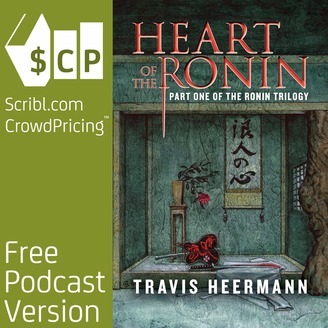 The new peace means that these masterless warriors, ronin, often must stoop to crime and banditry to feed themselves. Ken’ishi finds himself plagued by the hatred and mistrust of peasants and samurai alike. When he saves a noble maiden from a pack of bandits, he and his faithful dog become enmeshed in the intrigues of samurai lords, vengeful constables, Mongol spies, and a shadowy underworld crime boss known as Green Tiger. But Ken’ishi has a few secret weapons of his own, granted to him by his mysterious past and his magical upbringing. If only he knew more about his mysterious past, his parents’ murder, and the sword that seems to want to talk to him. . . . Heart of the Ronin is an action-packed historical fantasy, set against the backdrop of ancient intrigue and impending war, the first of a sweeping three-part epic filled with deadly duels and climactic battles. Creatures of folklore and myth are as real as the katana in one’s hand. And just as deadly. 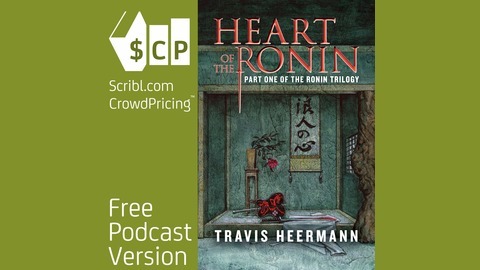 "A fusion of historical fiction and adventure fantasy, the first volume of Heermann's Ronin Trilogy is a page-turning folkloric narrative of epic proportions. In a strange, supernatural feudal Japan, 17-year-old warrior Ken'ishi, a masterless samurai with a mysterious past and a legendary sword, saves the life of Kazuko, a powerful lord's daughter. Soon he becomes entangled in a deadly web of treachery, obsession and vengeance along with a bevy of conspirators, spies, assassins and otherworldly monstrosities. Though Heermann does little to push the boundaries of the subgenre, his writing style is confident and fluid, his characters are well developed and his serpentine story line anything but predictable. Numerous tantalizingly unresolve. Kazuko finally begins to settle herself into her new life, wondering about Ken'ishi and future. Yasutoki's schemes of espionage and betrayal finally come together and he prepares to hand his homeland over to Mongol conquerors.